The Fall 2017 issue of Conservationist for Kids is now available on our website. 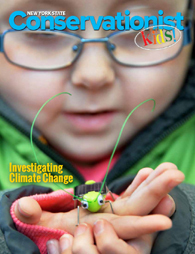 This issue introduces students to the topic of climate change, including its causes and effects. Students will also learn about ways to measure and reduce their “carbon footprint” and its impact on climate. Teacher packets are in the process of being mailed to the 4th grade classrooms of public schools throughout New York State and should reach you within the next week or two. Conservationist for Kids is included as an insert in the February, April, and October issues of Conservationistmagazine. You can subscribe to Conservationist for the low price of 7 issues for $12 on our website or by calling 1-800-678-6399.